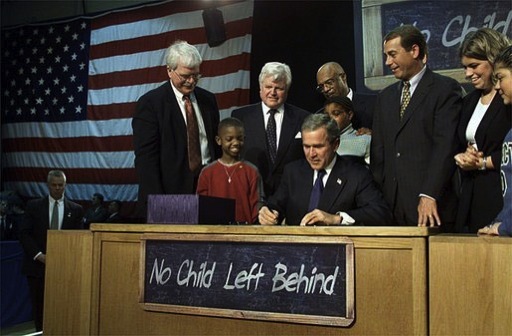 On January 8, 2002, George W. Bush signed into law, the No Child Left Behind Act. For 5,084 days, the United States has engaged in despicable acts of child labor, forcing its children to slog through physically and emotionally harmful toil and stresses, for reasons that have nothing to do with what was best for them. Of course, returning education to the hands of parents, teachers, states and school boards is not a solution. It is an opportunity for courageous and inventive educators to seise. So here are some suggestions from one in a minority of educators, who actually remember classrooms unconstrained by policy compliance and political accountability. R – Throw the scripts away and Resourcefully invent practices that work here and now or our tomorrow. I – Return scientifically proven research to its proper function and Innovate. Bring back the art of teaching. 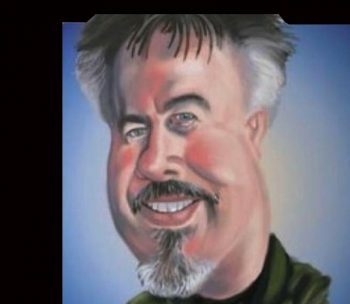 P – Reject the practices of beating our children over their heads with test-prep. Instead, inflect them with Passion. Become passionate again about teaching and what it is that you teach, and make it glow with that passion. N – Take the “No” out of education. For 5,000 days, education has been defined by it limits. Education today must be defined by its lack of limits. C – Don’t teach students to collaborate, to be communicators, to be creative. Instead, create learning experiences that utilize Collaboration, Communication and Creativity to energize students’ accomplishment of things bigger than they are. L – Reinvent Literacy. Free yourself and your students from 19th century notions of the three-Rs. Look for the literacies that instill in us all, a learning lifestyle. B – Be Bold. Courageously teach, what has not been taught before and craft learning experiences that are new and exciting. You students will love you for it, and their communities will fund your educational programs. 1 Orwell, G. (1946). Politics and the English Language. Penguin. 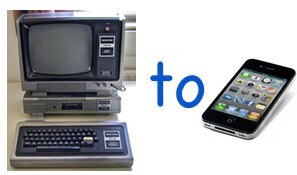 Our discussion, however, had almost nothing to do with technology, but concerned the era in which we began teaching. For me, it was a full 25 years before No Child Left Behind standards-based teaching and punitive high-stakes tests stained the “art of teaching.” Things were quite different in terms of the autonomy that teachers exercised in determining what and how their children learned – and some mediocre teachers, admittedly, took advantage of the freedom. However, most, whom I came in contact with, used their academic freedom as a seedbed to create dynamic and effective learning experiences for their students. For years I have felt that this-too-will-pass, that the arrogant belief that we can know and teach everything our children will need to know to be prepared for their future simply makes no sense, and that we would come to our senses. But it occurred to me, during that email exchange, that more and more of the teachers in our classrooms today were trained to test-prep and have been indoctrinated to an education system based, more than ever before, on an industrial production model. 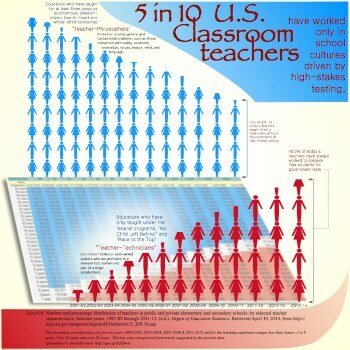 So I did some research and tinkering with a spreadsheet, and found that about half of the teachers in U.S. classrooms today have never worked in a school culture free from high-stakes testing. To illustrate this, I made an infographic that shows the decline in teachers who have experienced academic freedom and the rise in teachers who have always worked under the constraints of government/corporate standards. To be sure, this does not mean that there aren’t young educators, today, who are courageously and creatively going beyond the regimentation that is the character of test-prep classes, nor that there aren’t older teachers who are happy to model their classrooms on mass production. An approaching point of no return. I used a document from the National Center for Education Statistics a part of the U.S. Department of Education (see below). It featured demographic data about U.S. teachers, starting in 1987. The table included gender, ethnicity, age, education, years of experience, and teaching levels and subjects. I fairly easily imported the table into an OpenOffice spreadsheet and cropped it down to just the data on years of experience, starting with 1999. To complicate things, the table included only data for every 4th year, 1999, 2003, 2007, and 2011, which was not enough to plot the level of accuracy that I wanted. In addition, the years experience were grouped, i.e. less than 3 years, 3 to 9 years, etc. I searched further, but could not find any more complete data at the national level. If you know of such a document, please comment below. To fill in the blank years, I worked my OO spreadsheet so that it calculated trends from the 4 years and the experience ranges, and filled in the blanks, across and down, based on those trends. Not a perfect solution, but the point of my infographic was to illustrate a trend, not precisely measure a phenomena. Having such a seemingly rich data set enticed me to plot for other trends and anomalies, such as specific rises or declines in teacher numbers, indicating times of sudden influx of new teachers, or increased retirements or, and I hate to suggest the possibility, mass resignations. Alas, it would take more completely accurate information to do such a thing, not just calculated trends. Technology should be invisible. It is the pencil and paper of our time. But until every learner and teacher-learner has sufficient and equitable access to appropriate information and communication technologies, we should enthusiastically continue to make the “T” word an explicit and high-volume part of all of our planning. Washington Post blogger, Valerie Strauss, has invited faculty members of Columbia University Teachers College to guest blog about President Obama’s Blueprint for rewriting the No Child Left Behind law. Yesterday’s contributor was Ellen Meier, professor of computing and education and co-director of the college’s Center for Technology and School Change. The blueprint effectively consigns technology to a subordinate role in reform, rather than recognizing it as a fundamental requirement for new millennium teaching and learning. By consolidating technology funding, it effectively silences the voices of innovative educators interested in using technology to leverage effective, imaginative approaches to schooling. I agree with Meier’s statements and I get the same impressions from the document, which seems to address tech from a “business as usual” perspective. However, this is all part of an ongoing struggle in the ed-tech community between treating information and communication technologies (ICT) as a separate element in the endeavor of education or infusing it into the framework of teaching and learning — integrating the technology and therefore, making it invisible. A while back, I wrote about a conversation I was part of in Austin about the prospects of the state’s elimination of a required technology class (What Difference Might One “S” Make?). With the dedicated and state-mandated class, tech gains importance and prestige — not to mention funding. But technology instruction, which carries specific accountability measures, becomes too strictly defined and separated from the rest of the school. Without the technology class, schools become more free to specialize, adapt, innovate, and truly integrate, but they lose the authority and funding to do so. I do not believe that Dr. Meier is advocating either position to the exclusion of the other. None of us are. We are simply finding the language that describes ICT as a critical component of the education formula in a way that empowers success, provokes innovation, and is relevant to the contexts of teaching and learning in the 21st century. ..is more likely to result in “technologizing” the status quo —integrating technology into existing practices – rather than using technology to create engaging new learning environments. However, we get a clearer look by running a Word Tree (see left) revealing that technology is used 14 times in the document. Five times it is listed along with STEM subjects. Two of the listings are presented in a way that, to me, imply a continuum subjects, placing history, civics, foreign languages, the arts, financial literacy, and “other subjects” at the less important end — or at least separating STEM out from other subjects. 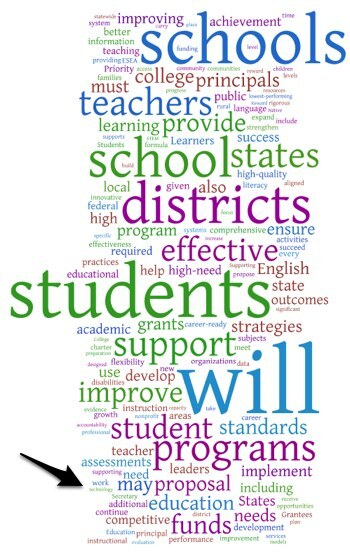 Nine times it is listed as a way to improve instruction, address student learning challenges, and accomplish the goals of the grant. But even its poor showing in the word race shouldn’t, alone, be cause for concern. After all, “technology should be invisible,” RIGHT? (“technology should be invisible﻿” shows up in 2,700 Google-indexed web pages). There are three objections that I have to where the blue print is taking us. The One size fits all approach the our promotion of the STEM subjects seems to ignore completely that even though we do need more youngsters pursuing a science, technology, or mathematics field, not everyone needs to, and we will continue to need smart and creative people pursuing the “other subjects.” When people are complaining about TV, they are not usually complaining about the picture size or quality. What they want is better stories. Engineering is easy. Telling a better and more compelling story is hard. Because information is now networked, digital, and abundant, what it means to be literate has changed and so too has the meaning and method of lifelong learning. Technology should be invisible. It is the pencil and paper of our time. But until every learner and teacher-learner has sufficient and equitable access to appropriate information and communication technologies, we should enthusiastically continue to make the “T” word an explicit and high-volumn part of all of our planning.